Painting by Cal Sacks RR2 Westport, Conn. A book search revealed that Sacks had illustrated anthologies in the '60's for editor Walter B. Gibson, on 3 nefarious subjects: The Fine Art (of Swindling), also (of Spying) and (of Murder). Sacks also did illustrations for at least 3 other books on quite different subjects: The South Seas, Earthquakes and California Wines. Can't tell if this was done "on location," from memory or just "imagined." Reminds me vaguely ofa lighthouse tender that was turned into a Haunted House to frighten visitors during October & Halloween. The pilot house is not really big enough and the roof of the "Texas" cabin under the pilot househas a "peak" like a "landlubber's" building but there's some interesting atmosphere and techniquegoing on in the painting itself. The dealer I bought this from said that there were indications thatHarold Stasny may at one time have been an art instructor at a Louisiana university. The name on the paddlebox from what I can make out looks like nonsense, something like: PxhPJYprobably just improvised to simulate a name without being actual words. Only 54 when he died, Jones managed to accomplish an incredible amount of art and influence in his relatively brief 5 and and a half decades. He gravitated away from St. Louis to New York City and the artists and political awareness there. "The people stand off, convinced sufficiently but without enough courage to follow their own conviction. And still that other thing exists, indifference." 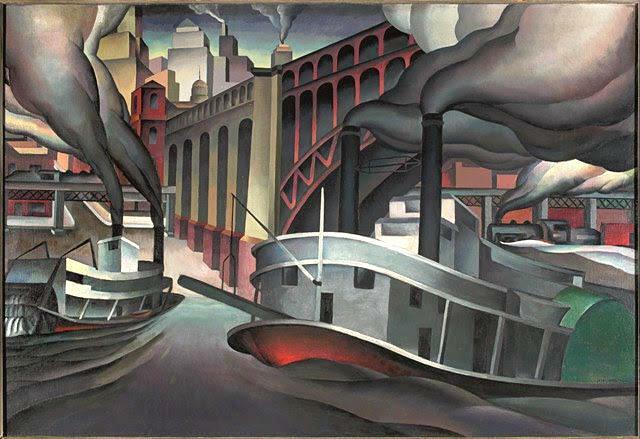 Produced in conjunction with the Museum's 2010 exhibition entitled Joe Jones: Painter of the American Scene, this video explores the life of the extraordinary artist Joe Jones and his connections to St. Louis of the 1920s and '30s. The video features interviews with the artist's children, insights from exhibition curator Andrew Walker, and comments on Jones's work by art historians. Archival photos of St. Louis locations that played a role in the early work of the artist, as well as historic pictures of Jones and his family and friends make the film visually compelling. This film received a mid-America Emmy for directing in October 2011. 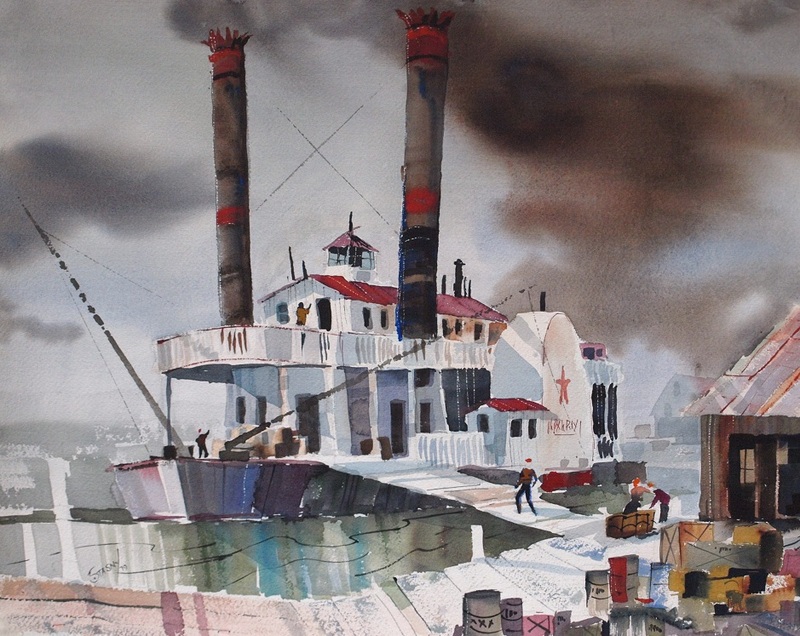 On the RIGHT is a detail from Missouri artist Bryan Haynes' painting of a circus unloading from a steamboat and a train. Performers and diverse animals form a parade that is marching up to the top of the hill where the tents for the circus are waiting for them above an unnamed Mississippi River town. 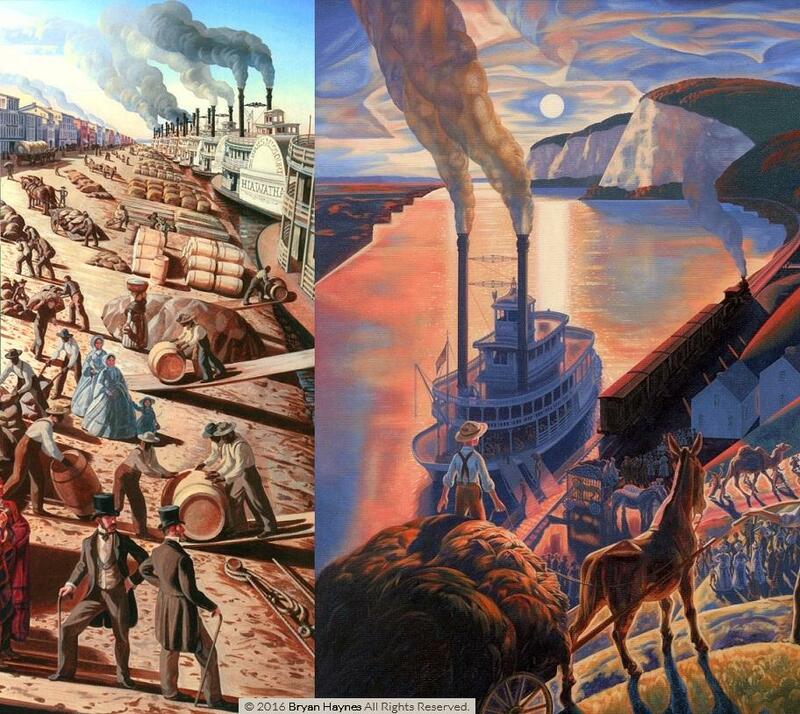 Bryan's 2013 art book of his NEW REGIONALISM work is beautiful and features the detail on the LEFT from his 2010 Gateway Arch mural which includes an atmospheric depiction of the Mississippi River landing at St. Louis, Missouri crowded with steamboats during the 1850s. 204 pages presenting over 225 color illustrations. In the nineteenth century a circus might arrive at a village on the Mississippi both by steamboat and by rail. "Mural Artist - Bryan Haynes | School of Fine Arts | Academy of Art University"
Bryan Haynes shares images of his work throughout his career as an illustrator and mural artist. overall size of paper with margins 20" x 14-1/4"
image size 17-5/8" x 11-5/8"
Tom Freeman passed away, unexpectedly, on June 16, 2015. A brilliant artist, he will be missed by so many around the world. His prints are now signed by his wife Ann. Tom never had any formal art training and had always considered his talent as a God given gift. In fact school was of very little interest to him. Tom joined the U.S. Marine Corp Reserve in 1970. He later transferred from the Marine Corps Reserve to the regular Army. His military service extended from 1970 to 1977. Tom's professional art career started when he left the military. He would visit the U.S. Naval Institute and would take samples of his work to them. Finally, he asked what it would take to get his artwork on Proceedings Magazine. A gentleman by the name of Dell Kaiser showed Tom the artwork of Carl Evers. Tom contacted Carl and to this day considers Mr. Evers the master of watercolors. "Carl was very supportive, he told me to look closely at the art and that I would figure it out on my own." Finally, Proceedings used one of Tom's paintings for their cover. This started Tom on the path of success. Tom started taking 35mm slides of his work and sending them to various book publishers. The first publisher to contact him and offer him a cover was G.P. Putnam & Sons. Tom has worked with most of the large publishing houses such as Dell, Jove, Bantam, and Berkley. Tom's work has appeared on many magazines such as Readers Digest, Popular Mechanics, Boating, Yachting, Business Week, and even the TV Guide. His work has been placed on porcelain plaques and plates for Franklin Mint and the Hamilton Group. Tom's artwork has been exhibited in many galleries Kirsten, Greenwich, Mystic, and the Grand Central Gallery. He has done work for the National Parks Service and many corporations throughout the world. In 1986 Tom was asked to hang his original paintings in the West Wing of the White House. Currently, there are 8 original paintings hanging there along with several of his limited edition prints. To commemorate the 50th anniversary of the Japanese attack on Pearl Harbor, Tom produced a collection of 42 paintings now on permanent exhibit at the Arizona Memorial in Honolulu, Hawaii. Tom completed 12 paintings, which were on exhibit at the Naval Museum in Washington, DC. commemorating the 60th anniversary of the attack. One of Tom's paintings was donated to the State of Israel; it hangs in the Immigration/Clandestine and Naval Museum in Haifa. On April 10, 2002 Tom had the honor of giving one of his paintings to the Holy Father, Pope John Paul II in Vatican City, Rome. The painting is hanging in Pope Pius IX museum in Italy. The White House Historical Association commissioned Tom for 4 years to produce cover art for the Association's annual Christmas card. Tom was awarded the Department of the Navy Superior Public Service Award on April 3, 2003. On September 3, 2003 Tom presented a painting to President George W. Bush depicting the President's landing aboard the U.S.S. Abraham Lincoln. The painting was presented to him in the Oval Office. Tom won the 2003 Gold and Platinum Ozzie Award in the category of "Best use of illustration for a single article," Popular Mechanics Magazine, The Hearst Corporation. Tom also won the SILA award for the 42nd Society of Illustrators Los Angeles annual contest; winning the silver award for Editorial Artwork. Tom had been selected as the first artist in residence to the United States Naval Institute. Here is an extraordinary painting by artist Robert Hagemann which was published in black in white in an issue of the S&D Reflector. I wrote to Bob back in the 80's and he kindly sent me a color slide of the painting from which this print was made. Bob also sent some beautiful black and white prints made from his expert pen and ink drawings of a number of classic steamboats. Bob's style is classical in the tradition of European masters and also evocative of John James Audubon who was born into a French Colonial family in Santa Domingo which is now Haiti in 1785. Audubon's paintings of birds and mammals often included landscapes in the background in a style similar to Bob Hagemann's. The JACOB STRADER was out of the ordinary in style with a cylindrical-shaped pilot house and smokestacks aft of the pilot house instead of ahead of it. Also the front of the boiler deck enclosed with formal windows was unusual and anticipated how the CAPE GIRARDEAU's boiler deck would be entirely glazed in during her dozen year reign beginning in 1923 and and ending in 1935 when she became the GORDON C. GREENE. When the 1914 vintage IDLEWILD became the AVALON in 1948 she was given a similar window treatment in a less formal style. Attached plumbed, cropped and resized photo of the STRADER from the La Crosse collection which proves that her rather fantastical appearance was accurately depicted by Bob. Built 1853 at Cincinnati, Ohio which was also her first home port. She ran Cincinnati-Louisville, entering the trade on June 7, 1853. The STRADER had "low pressure" machinery and advertised as such to assuage the fears of those who were leery of the high pressure engines of those days. During the early part of the Civil War she was often used to convey wounded and sick soldiers as her cabin was 306 feet long with 310 available berths. 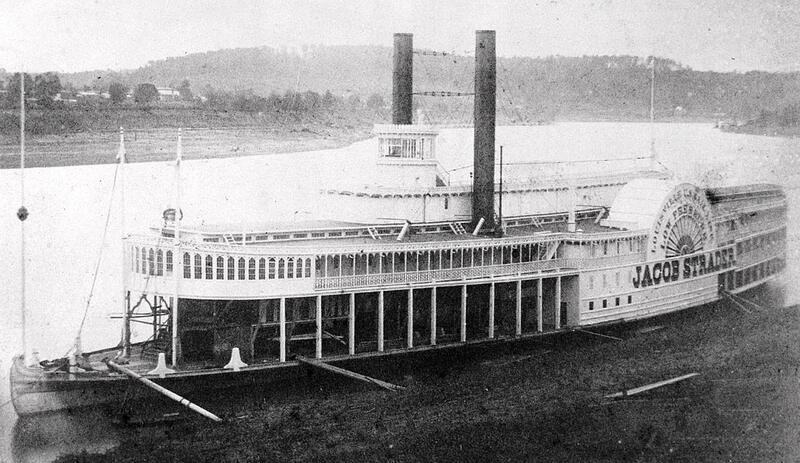 She was dismantled at Madison, Indiana in July 1866 and her machinery went into the construction of the steamer RICHMOND. 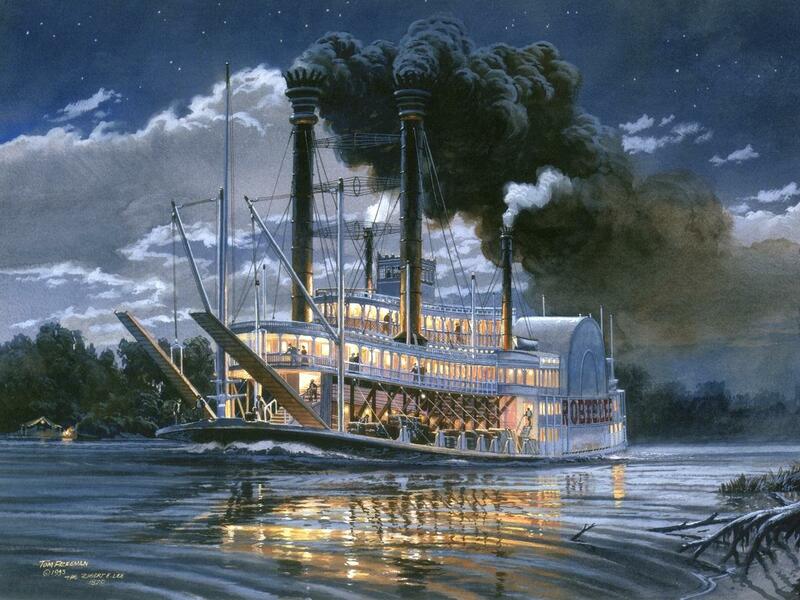 Exceptional, beautiful painting of a vintage Sacramento River scene by Park Merrill. 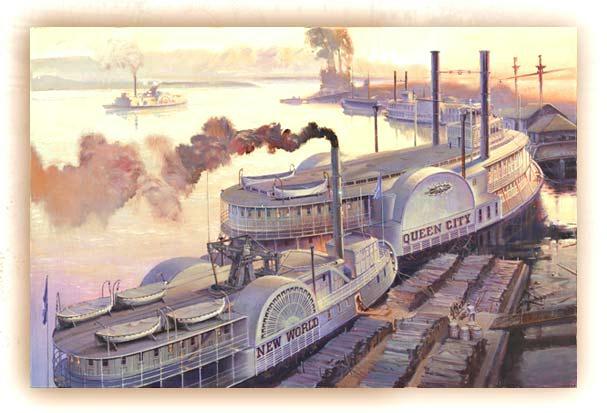 Hope that a print of this painting with the steamboats New World, Queen City, Lady Adams, Helen Hensley and Senator will eventually become available. A truly memorable work of art. Capturing the excitement and bustle of Sacramento's embarcadero in the 1850s, this nautical portrait - constructed from early photos and actual on-the-spot drawings - features some of the real-life illustrious steamboats of the day. Here in the forefront, at the foot of H though K Streets, workers attend to the New World, a walking-beam paddlewheel that was stolen from the East Coast and sailed around Cape Horn. When word reached Sacramento that she carried the deadly cholera disease on board, many people evacuated the town. Other steamers crowd the dock. Just beyond the Queen City is the Lady Adams, followed by the Helen Hensley - all vessels that offered regular transportation between San Francisco and Sacramento. Out on the Sacramento River in the distance, the Senator is seen flowing downstream. Park Merrill, a native Californian, was born in Fortuna, Humboldt County, in 1938. From an early age, Merrill showed signs of an artistic nature. After high school, Merrill attended Humboldt State College for a year and a half, taking many art courses. Wanting a more intensive art education, he attended the four-year professional art school, Art Center College of Design, located in Los Angeles at that time. Art Center is one of the three most prestigious art schools in the country. After graduating from Art Center in 1963, Merrill worked as an illustrator and graphic artist, ending his career with 27 years at Lockheed Missiles & Space Company in Sunnyvale. During that time he painted conceptual designs for satellite systems and other high-tech space programs such as Star Wars, Space Station Freedom, and the Hubble Space Telescope. Since his retirement, Merrill has developed his fine art skills and a style he calls "Soft Impressions of California." These images are from California's colorful past and present. Painted in oil, they combine pastel colors with soft edges. "This has been the most exciting work I have done to date," says Merrill and it is his hope that the art-viewing public will agree. This just in STOCKER'S LANDING On the Blackwater Levee, Circa 1905. Compliments of Killark Electric Mfg. Co. St. Louis, MO, 1977. Killark Electric is a leading manufacturer of electrical construction products for standard, harsh and hazardous environments. Including conduit raceway fittings, junction boxes, enclosures, lighting fixtures, plugs & receptacles, distribution equipment and standard and custom controls. In 1914 her name was changed from CONCORDIA to UNCLE OLIVER to honor Oliver Wilds, father of Captain Ollie K. Wilds. The UNCLE OLIVER was lost in a fire at Vicksburg, Mississippi circa 1926. 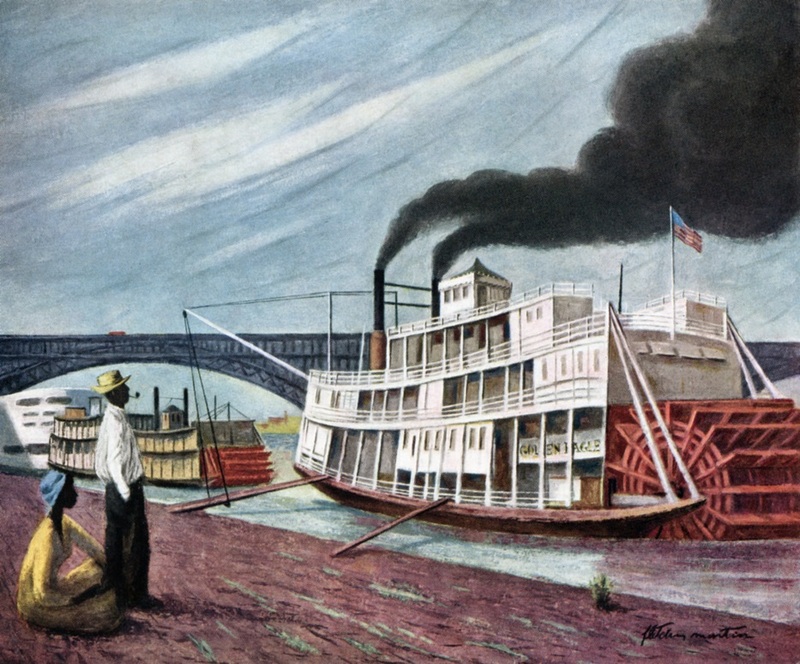 This painting of the CONCORDIA by an unknown illustrator was entitled "STOCKER'S LANDING on the Blackwater Levee, Circa 1905." It was commissioned and distributed for promotional purposes by Killark Electric Mfg. Co. St. Louis, Missouri in 1977. Killark Electric is a leading manufacturer of electrical construction products for standard, harsh and hazardous environments. Including conduit raceway fittings, junction boxes, enclosures, lighting fixtures, plugs & receptacles, distribution equipment and standard and custom controls. 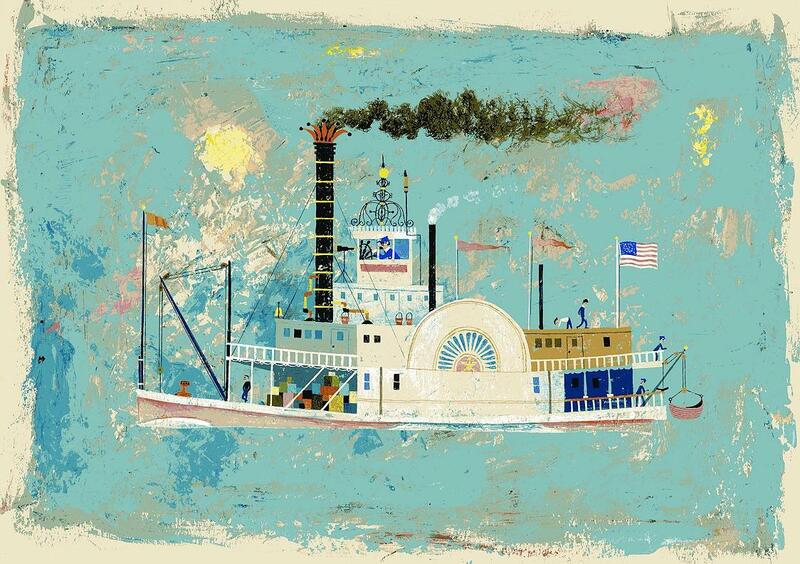 An example of charming paintings by Cheryl Harness that she made to accompany her 1998 illustrated biography of Sam Clemens with special emphasis on his association with steamboats on the Mississippi. Available from amazon.com. Prints of this painting were being sold by the artist Su Stella a while back on ETSY. 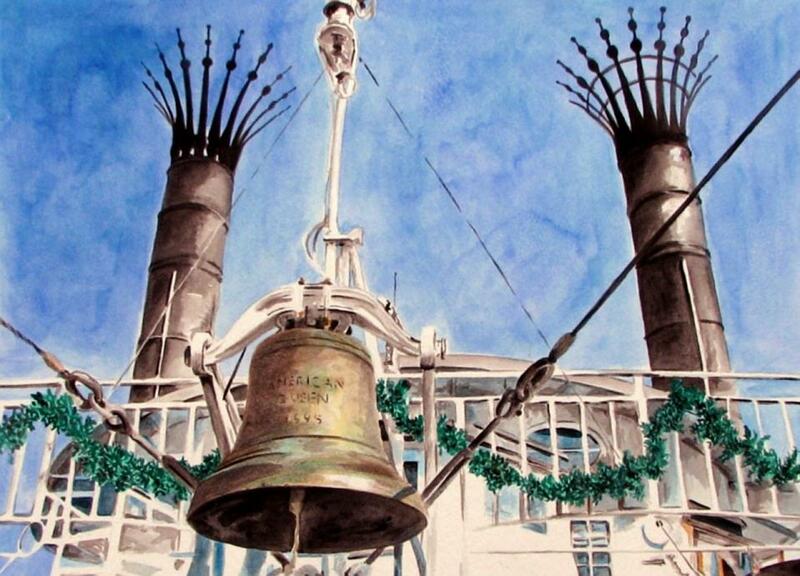 It's a pleasing image of the AMERICAN QUEEN's bell and stacks. The "pine garlands" suggest the occasion was during November/December, leading up to Christmas. [Copyright Su Stella]. Alla Golets Baltas was born in Kharkiv (Haco), Ukraine. Her father's artistic influence enabled Alla to begin painting at a very early age. In 1992, Alla formally studied art in the Ukraine, earning a degree with honors in Graphic Design from the Kharkiv State Arts School. While enrolled at Kharkiv State Arts School, she spent time outside of the university studying the technology of oil painting in the Hermitage Museum and the Russian Museum of Art. The museums, located in Saint Petersburg, Russia, deepened her knowledge about the history and development of art- She furthered her formal art education by enrolling in Kharkiv State Pedagogic University. In 1998, she attained the higher degree of Specialist Diploma, certifying her to teach in fine arts, drawing and applied arts. Alla started painting professionally in 1998. Her main focus was on Still Life, Religious Icons, Landscapes and Portraits. At age 29, she held her first exhibition in Kiev, Ukraine; she received significant acclaim. She became a member of the young artist association and her art was on display at the Ukraine union art exhibition for artist day and the Christmas exhibition in Kharkiv in 1998. Alla moved to Cherry Hill, New Jersey after spending few years in Baton Rouge, Louisiana. Continuing her work in still life landscapes and portraits and adding southern art, New Orleans landscapes, Louisiana still life and northeastern landscapes to her catalog of work. 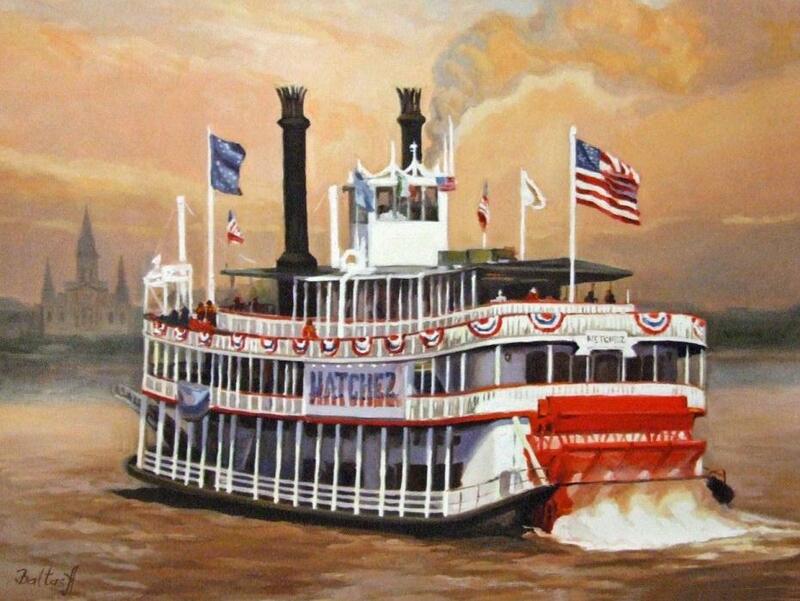 Undated painting by well known artist Fletcher Martin of the GOLDEN EAGLE at the St. Louis levee with the Eads Bridge and on the far left, the ADMIRAL, the showboat GOLDENROD and a towboat that pushed the showboat. This was probably painted sometime between 1940 (when the ADMIRAL was launched) and 1947 when the GOLDEN EAGLE sank. Fletcher Martin (April 19, 1904 - May 30, 1979), was an American painter, illustrator, muralist and educator. He is best known for his images of soldier life during World War II and his sometimes brutal images of boxing and other sports. He was born in 1904 in Palisade, Colorado, one of seven children of newspaperman Clinton Martin and his wife Josephine. The family relocated to Idaho and later Washington. By the age of twelve he was working as a printer. He dropped out of high school and held odd jobs such as lumberjack and professional boxer. He served in the U.S. Navy, 1922-26. His artistic skills were largely self-taught. He worked as a printer in Los Angeles in the late 1920s, and as an assistant to Mexican muralist David Alfaro Siqueiros in the early 1930s. He taught at local art schools such as Otis Art Institute. He won commissions to paint murals for the New Deal's Section of Painting and Sculpture, including Mail Transportation (1938), painted for the San Pedro Federal Building and Post Office in Los Angeles. Under the WPA he painted a mural study for the Kellogg, Idaho post office titled Mine Rescue (1939). Local industrialists objected that it depicted the dangers of mining, while officials of the Mine & Smelt Workers Union praised it. The industrialists prevailed and Martin painted an uncontroversial mural, Discovery (1941), depicting the prospector who founded the town. The rejected mural study is now in the Smithsonian American Art Museum. Perhaps his most ambitious mural, also done under the WPA, was painted for North Hollywood High School in Los Angeles. Legends of Fernandino and Gabrileno Indians (1937) depicts overlapping scenes of Native American life and ritual, and the world being carried on the backs of giants. As an artist-correspondent for Life Magazine during World War II, he made hundreds of sketches of U.S. soldier life. Fourteen of his paintings from the North African campaign were published in the December 27, 1943 issue of Life, and brought him national recognition. Among these was Boy Picking Flowers, Tunisia, depicting a young GI finding a distraction from war. He also made illustrations of wartime London and the June 1944 Normandy Invasion. His paintings often depicted men in conflict. Trouble in Frisco (1938, Museum of Modern Art) shows a brawl between longshoremen witnessed through a ship's porthole. Many of his most popular works were reproduced as woodcuts, lithographs or silkscreens. After the war he taught at the Art Students League Summer School in Woodstock, New York, settled in the town, and began raising a family. He experimented with abstractionism and began painting naïve images of women and children. During his career he was a visiting instructor or artist-in-residence at the University of Florida, State University of Iowa, the University of Minnesota, San Antonio Art Institute, and Washington State University. He received prizes from the Los Angeles County Museum of Art in 1935 (for Rural Family) and 1939 (for A Lad from the Fleet); the 1947 Lippincott Prize from the Pennsylvania Academy of the Fine Arts (for Dancer Dressing); and the 1949 Altman Prize from the National Academy of Design (for Cherry Twice). He was elected an associate of the National Academy of Design in 1969, and a full academician in 1974. Martin and his fifth wife, novelist Jean Sigsbee Small (married 1962) retired to Guanajuato, Mexico in 1967, where they lived until his death in 1979. "Lots of students get trapped in the effort to be original. After fifty million paintings have been painted you can see that it is impossible to be highly original. There is always precedent. Who would want to be that original anyway? A better intent is to see that one's work is truly one's own - an honest expression of deep personal feelings. The whole history of art, which can't help but affect one, will be filtered through your own personality to produce a sort of original statement." 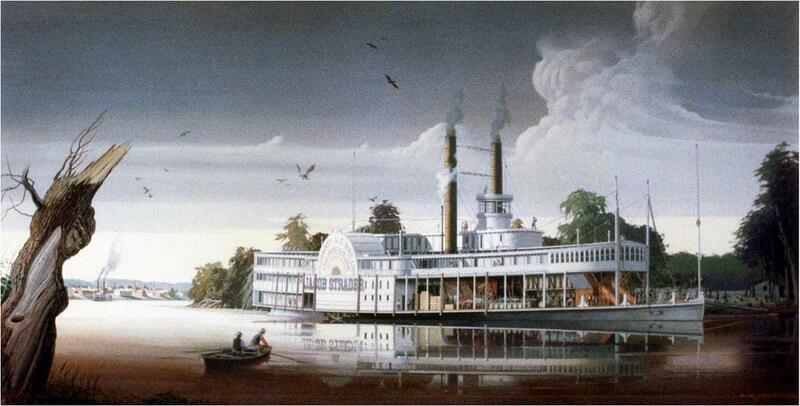 This painting is of the ROB'T E. LEE, by Louisiana artist August Norieri. An enlargement of this painting serves as the backdrop for Jim Waddell's Mark Twain performances at MARK TWAIN CAVE in Hannibal, MO (see the photo below of Jim performing for grade school students). The inspired career of August Norieri was tragically ended by his untimely death in 1898 at the age of thirty-eight. Norieri's paintings reflect his fascination with the waterways of New Orleans and the variety of boats that traversed them. 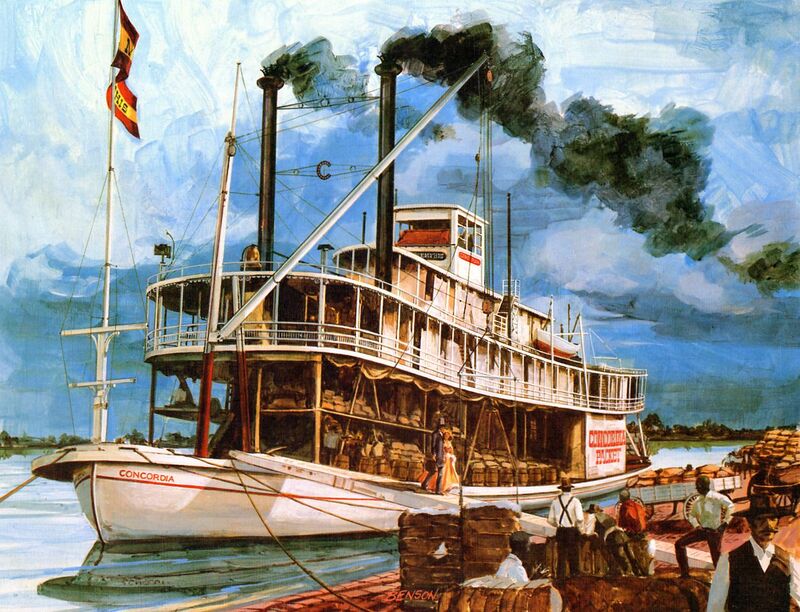 The picturesque steamboats along with the hard working tugboats of the Mississippi River, the sailing boats on Lake Ponchartrain and the steam launch pleasure boats on Bayou St. John all attracted the interest of the artist. 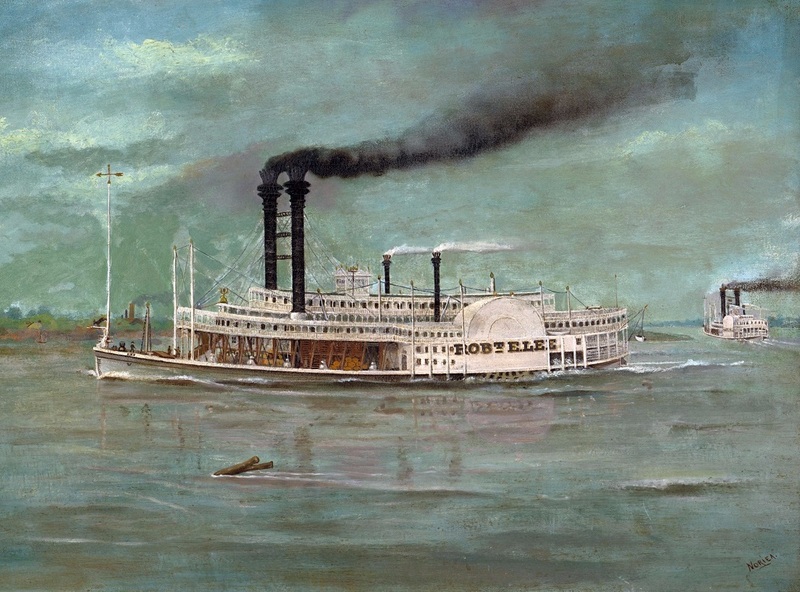 Norieri studied painting with local artist Andre Molinary, participated in the Creole Exhibit of the American Exposition of 1885 and was an active member of the Art Association of New Orleans. Born into a middle class New Orleans Italian-American family, Norieri's brother Baptiste became a tugboat captain and bar pilot.